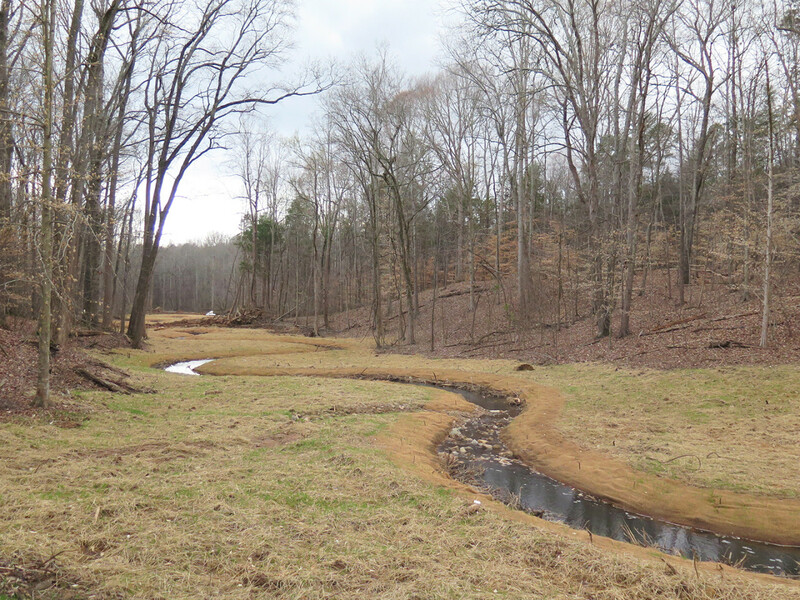 Construction on the Reedy Creek Stream Restoration project is now 100% complete. 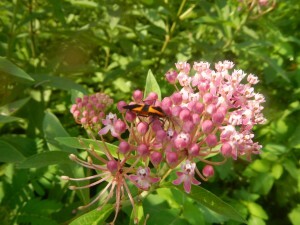 Planting crews have installed native plants throughout the project. Wildlife has already been spotted enjoying the newly restored habitat. 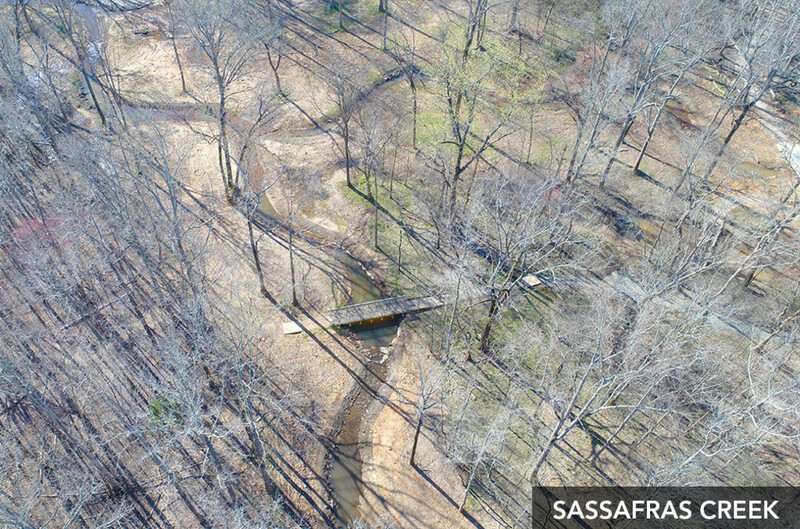 The trails are now open for the public to enjoy as well, including two new bridges in the park. The City will continue to monitor the success of the project over the next five years. Continue to check back for annual updates and photos. 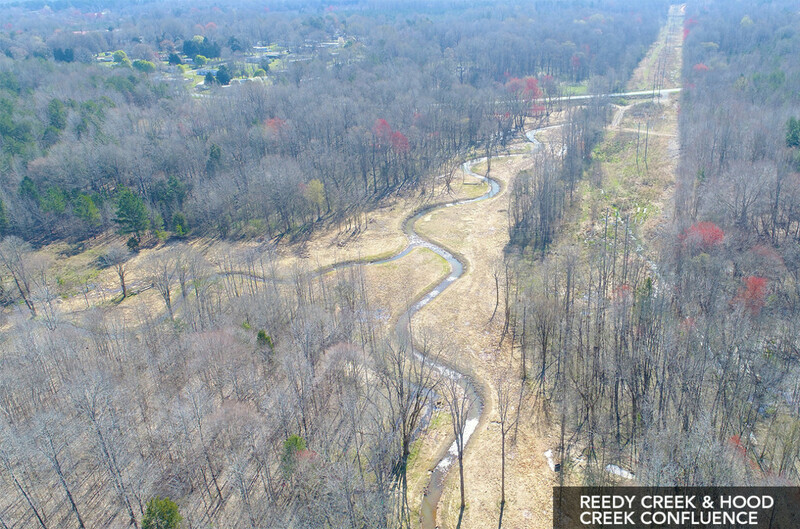 Reedy Creek construction is now 98% complete. Crews are planting native trees to shade the stream and provide habitat for animals. Surveyors are collecting data to map the newly constructed streams. 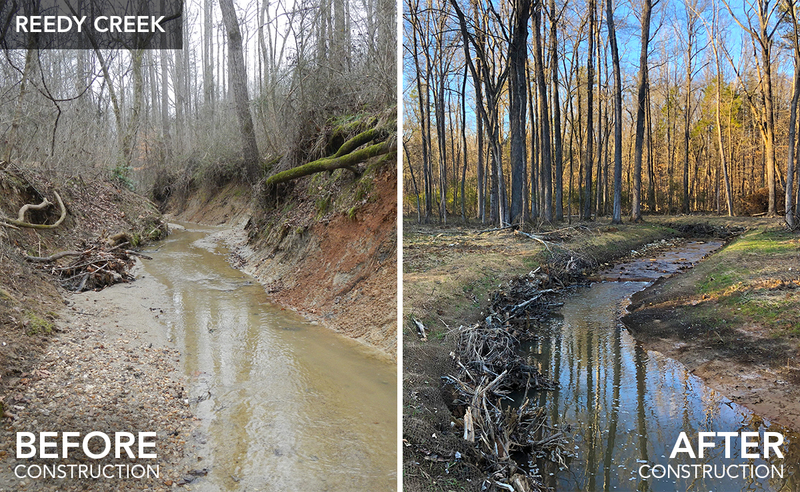 Below is a before and after photo of Reedy Creek, which is the main creek of the project. Stay tuned for more progress updates! Construction is now 70% complete! 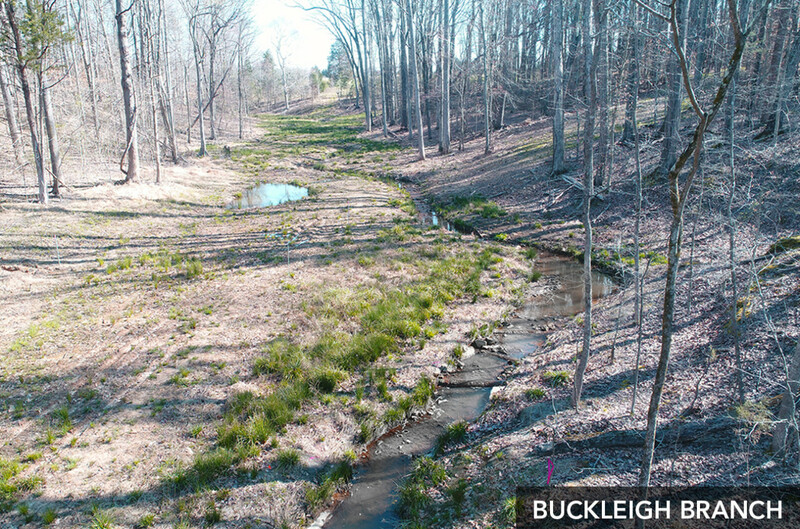 Check out the below before and after photo series of Buckleigh Branch and Upper Hood Branch. Construction will continue through the winter. Trees will be planted in the floodplain during the winter. Please check out the interactive map for a few pictures of completed construction. 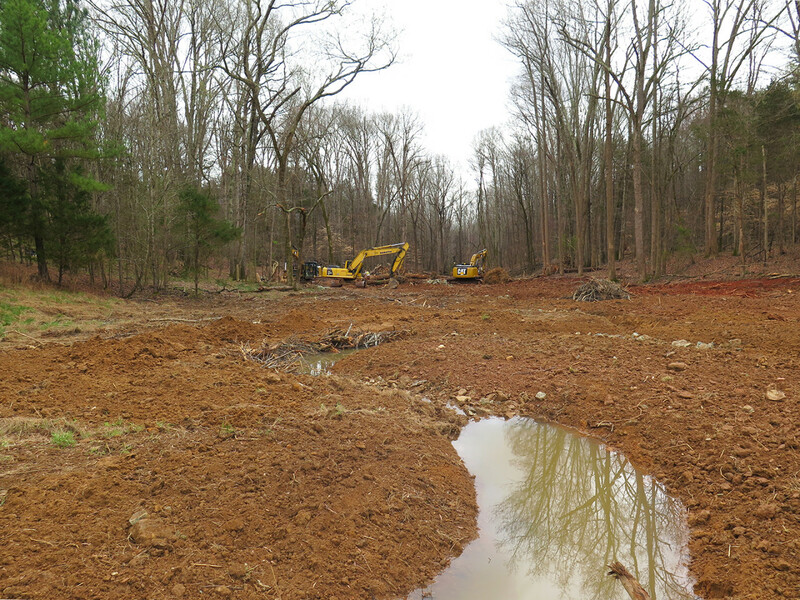 Construction is underway at the Reedy Creek Stream Restoration project. 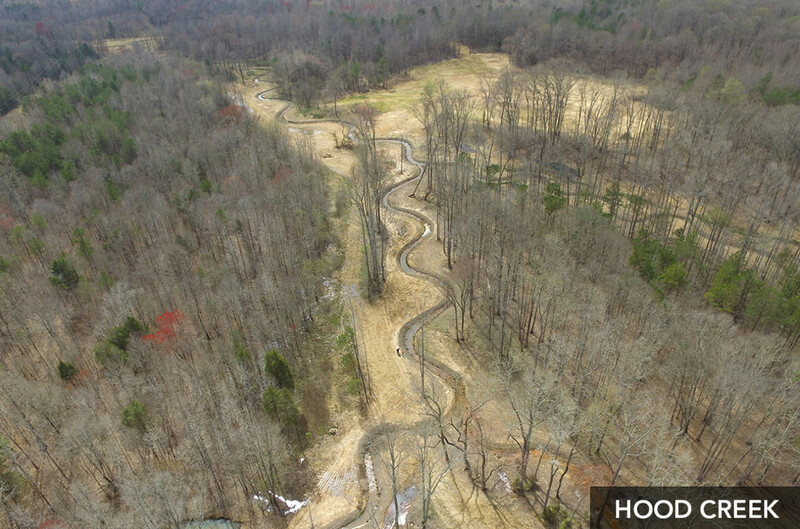 Construction crews have completed 2,000 feet of new stream channel. The new stream channel has lots of areas for fish and bugs to live. Landscape crews are currently planting trees. Construction will continue for another year. Please continue to stay off the closed trails for your safety and check the website for updates. 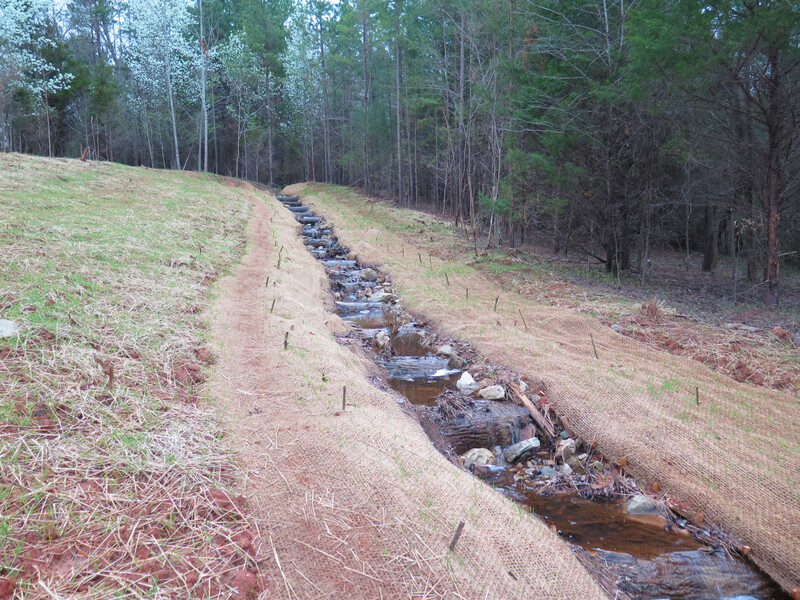 North State Environmental construction crews are gearing up to start construction on the Reedy Creek Stream Restoration Project. On November 1st, crews will arrive on site, accessing the park off Plaza Road Extension, and begin clearing the path for the new stream channel. You may see parked construction equipment sooner. Expect construction to last for a year and a half. Sierra Loop, Robinson Rockhouse, and South Fork trails will be closed during construction. If you would like more information about the project, please contact William Harris, City of Charlotte project manager, at wtharris@charlottenc.gov or (704) 353-1147. 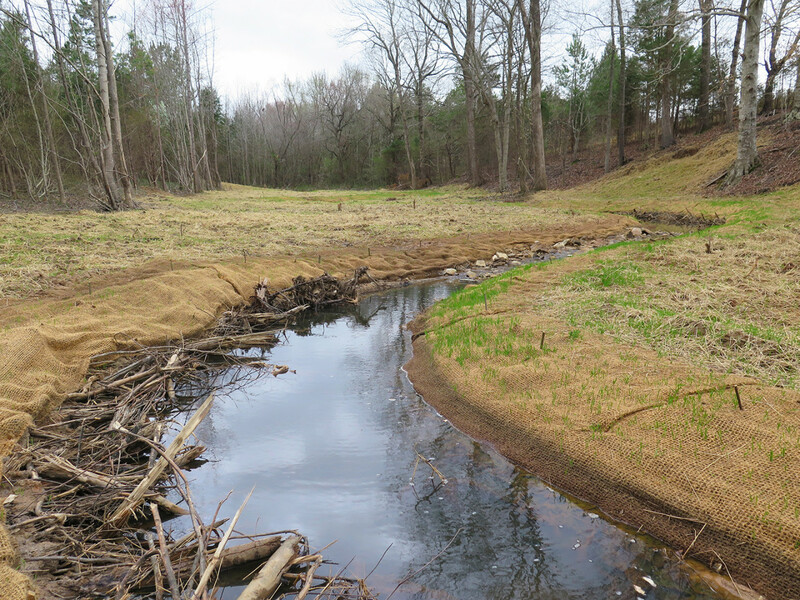 We are excited to share that progress continues on move forward on the Reedy Creek Stream Restoration Project. As of this month, easement closings are in progress, permits are in the review stage, and the Site Specific Mitigation Plan (SSMP) has been approved by the Interagency Review Team (IRT) comprise of the US Army Corps and other state and federal agencies. 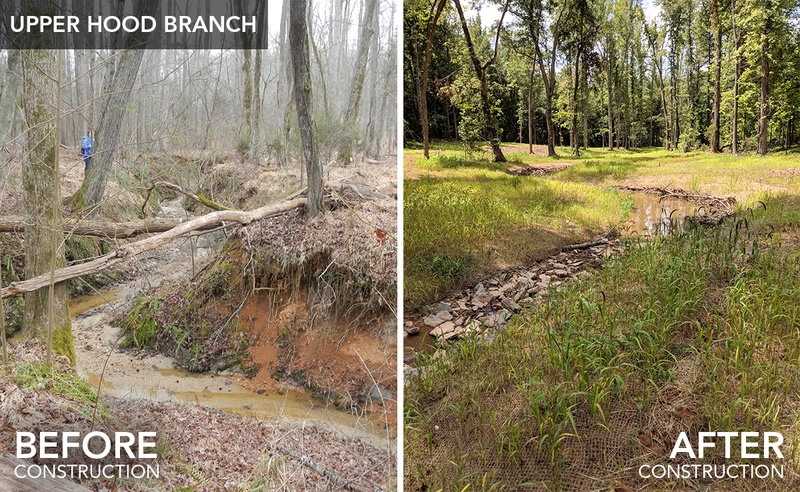 Be sure to visit the Reedy Creek Stream Restoration Project booth at the Hummingbird Festival (August 20, 2016 at Reedy Creek Nature Center) to learn more about the project! 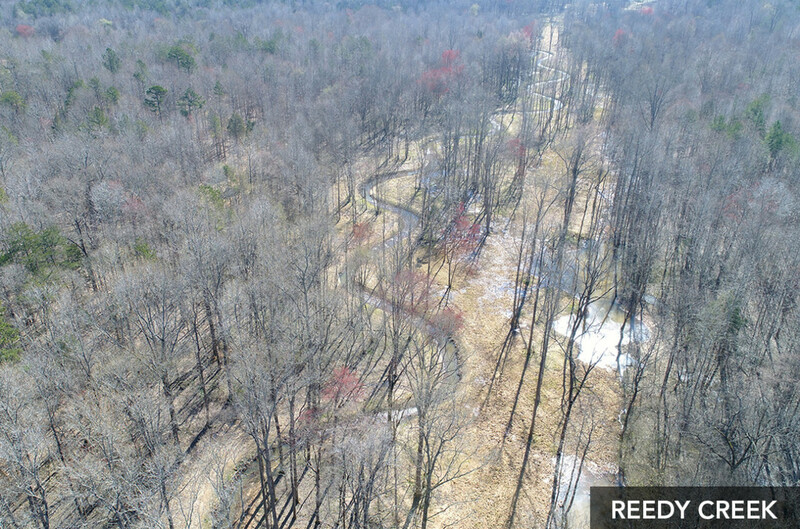 Exciting news for Reedy Creek Park and Nature Preserve fans! 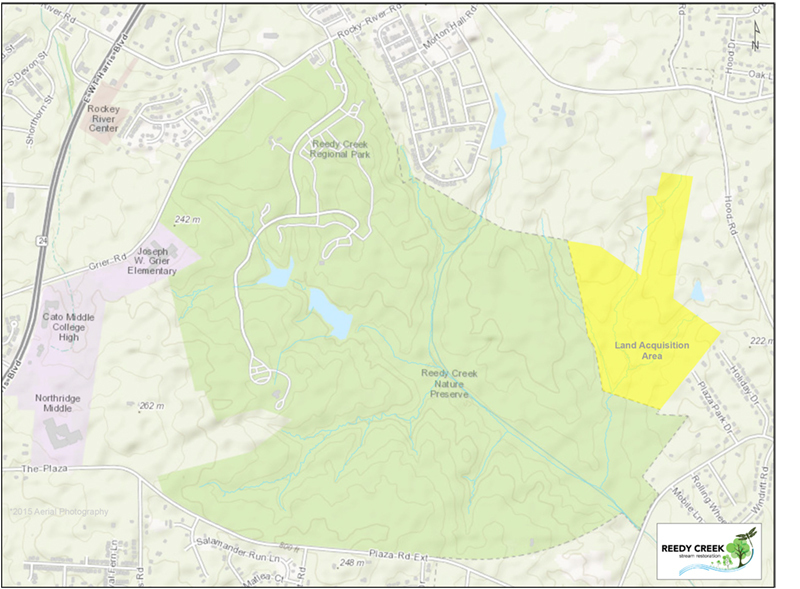 Mecklenburg County recently acquired 3 parcels of land adjacent to the current park, adding 95 acres to Park & Recreation’s holdings and protecting this portion of the Reedy Creek watershed from development impacts. 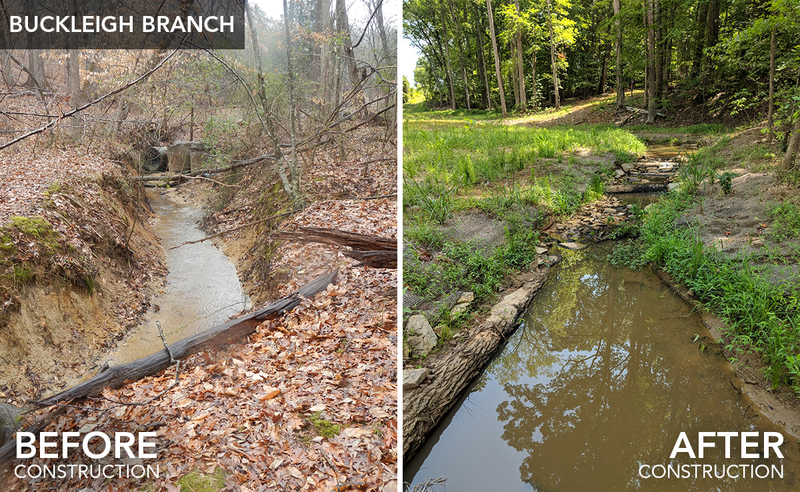 The newly acquired parcels contain portions of the stream restoration project, which will stabilize and improve water quality and habitat on the stream network throughout the park. The following map shows the newly acquired parcels in yellow. On November 10th, representatives from Mecklenburg County Park and Recreation, Charlotte-Mecklenburg Storm Water Services, and Wildlands Engineering, Inc. will give a project update at the Park and Recreation Commission meeting. 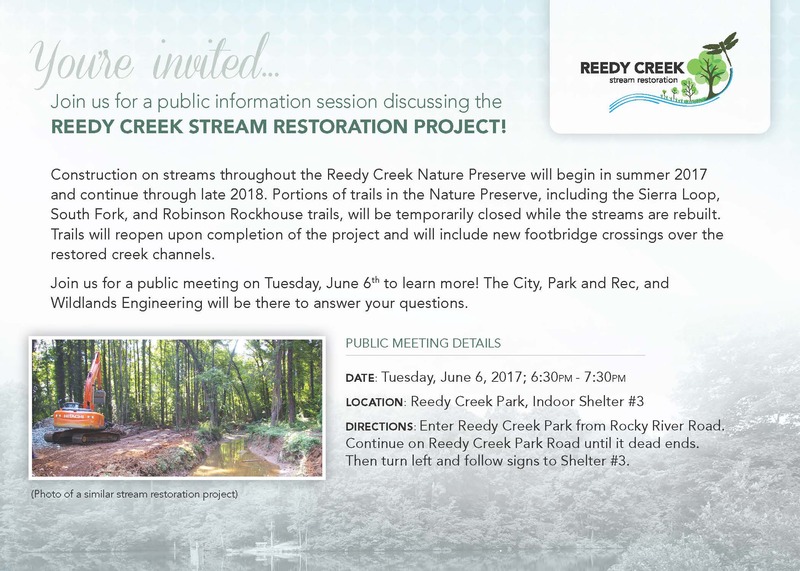 The Park and Recreation Commission,which is made up of citizens that serve as a liaison between the Park and Recreation Department and Citizens of the County, is one of the stakeholders for the Reedy Creek Stream Restoration project.